Articulated Jet sled is one of the OCS's new assets added to OCS's post trenching equipment spread. This jet sled is designed, fabricated and tested completely at OCS facility and under the close supervision of OCS engineering team. 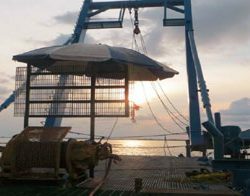 AJS is designed to be used in the extreme shallow water jetting system, the areas which are not accessible by using jetting equipment which must be supported by an attendant barge. AJS is designed to be transportable in two x 20 ft open top containers. 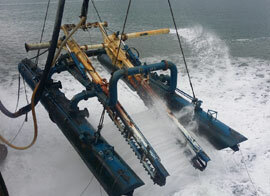 AJS is designed to be floated with minimum draft into very shallow water. It is then ballasted down over the pipe. In very shallow water, the whole sled and pontoon arrangement is maneuvered by winches on the beach and on the mother barge.